At 12:02 PM EST, SpaceX’s Dragon capsule was successfully docked and securely bolted to the International Space Station’s Harmony node. 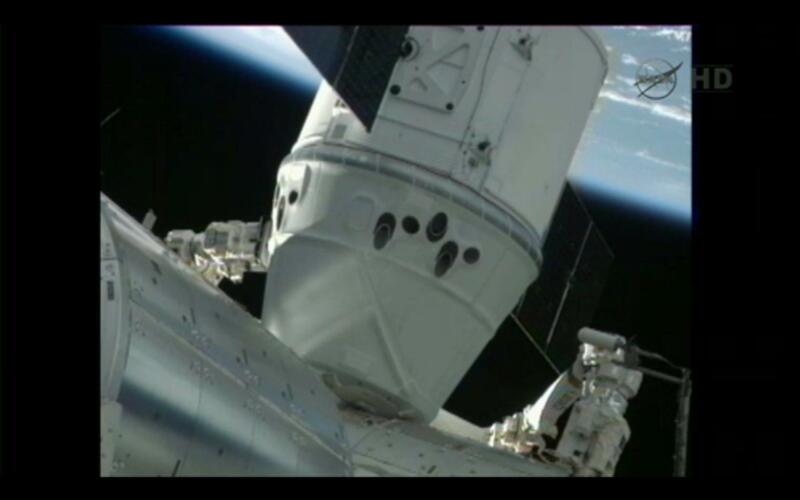 SpaceX's Dragon capsule successfully docked to the Harmony node (Credits: NASA). Although the Dragon’s mission in not yet over, everyone was in a mood to celebrate following the historic first commercial docking in space. NASA Administrator Charles Bolden called ISS to congratulate the crew on a job well-done, while SpaceX founder Elon Musk admitted, to a background of cheering employees, that it was probably time to break out the champagne. In a post-docking conference, Musk said that he’s not too concerned about the remainder of Dragon’s mission, since Dragon has already been through a reentry on the prior test flight. Focus now turns to what happens beyond the next few days. In the same press conference, ISS program manager Mike Suffredini indicated that the Dragon’s next flight – this one with a full operational cargo – could take place as early as September. Musk is anticipating a crewed Dragon launching in three years’ time. Meanwhile, the competition isn’t standing still. The next commercial vessel that will attempt to rendezvous with ISS could be Orbital Science’s Cygnus vehicle in December, although Musk is quick to point out that Cygnus is not able to return cargo from the station to Earth as is Dragon. On Saturday, May 26, the ISS crew will pop Dragon’s hatch and begin to unload, although most cargo operations will take place Monday-Tuesday, leaving the crew some time to recover over the weekend from what has been a hectic schedule in the past few days. Dragon will detach from ISS and reenter Earth’s atmosphere on May 31. It will splash down in the Pacific Ocean from whence it will be collected by SpaceX personnel.